I am a big fan of those characterful old Victorian tortoise stoves which you still see in some medieval churches, especially rural ones where the thought police from the Health and Safety Executive haven't dared venture yet. However, they can occasionally cause problems, and this church is a good illustration of that, because an overheating stove and chimney caused the thatched roof to catch fire one day in 1865, and the building was completely gutted. This church was out in the fields in those days, and as so often in Norfolk, the opportunity was taken to rebuild closer to the centre of population. The new church of St Margaret is now in the High Street. In those days, Hopton was a fairly remote Suffolk village of barely 250 souls, but today it has grown into a near-suburb of Great Yarmouth. In 1974, the borders were redrawn, and Hopton was moved into Norfolk along with the rest of Yarmouth's urban sprawl. 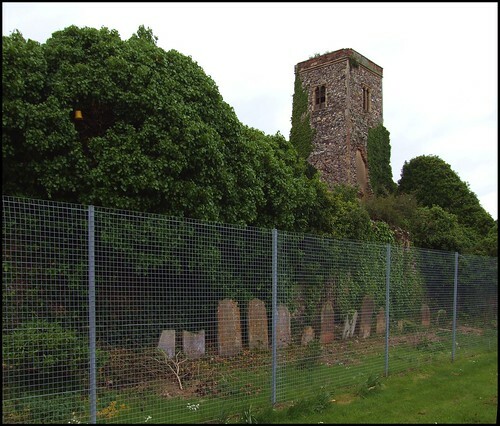 When I came this way a couple of years ago I was dismayed to find a ruin that seemed to have been abandoned to elder and ivy, surounded by a rusting fence. I had hoped to find somewhere like Stanton St John, where the lawns inside the nave are neatly clipped and you can wander at will, but this ruin was in a dangerous condition, and featured on Norfolk County Council's Buildings at Risk register. The churchyard had been converted into a scrubby park. I wasn't terribly impressed, and said so. But shortly afterwards I was contacted by local people who told me that they were taking the ruin to task, clearing the overgrowth and making the ruin safe. I came back in September 2010, and was pleased to find a work in progress. They are doing a tremendous job, and although I do not normally add links to external websites of individual churches to these pages, I am happy to do so here. St Margaret must have been a big church, with a wide south aisle which appears to have extended into the chancel as well. I am sure that, if it can be made fully safe and accessible, the ruin would be a pleasant adornment, and even a historical act of Christian witness.